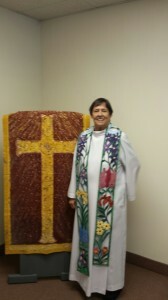 Sadly, our priest, Claire Irene Gareau has transitioned to a new life. Claire was was ordained a priest in April 2016. Claire served our community as a presider and homilist. Claire had a great love for the Eucharist which was so evident in her preaching. Claire Irene Gareau, a cradle Catholic, knew in the third grade she would join the School Sisters of Notre Dame. Entering directly from high school, Claire, then Sister Marie Jean Gareau, SSND, continued her education at the College of Notre Dame of Maryland earning a B.A. in Biology, while teaching seventh grade, and subsequently high school biology. Like many other religious sisters shortly after Vatican II, Claire decided to leave the convent. In 1970, Claire began a 25-year career with the New York Telephone Company. Even though, she enjoyed each of the positions she held there, in 1995 Claire took an early retirement package, which resulted from the divesture of AT&T and its operating companies. It wasn’t long before Claire realized full time retirement was not for her. She volunteered for her town’s First Aid Squad and found being an EMT very rewarding. Claire also did volunteer work for Habitat for Humanity in Belize. Two part-time jobs followed which she thoroughly enjoyed. Throughout her adult life, Claire traveled the world extensively with her longtime best friend, Virginia O’Sullivan. In 2011, Claire decided to return to school full time to study theology, which she had wanted to do in the 1960s. She quickly earned an MA in Theology at Seton Hall University, where she attended many classes with seminarians preparing to serve in the Archdiocese of Newark. While attending a Call To Action conference, Claire was introduced to Roman Catholic Women Priests (RCWP). When she learned that Mary Ann Schoettly, RCWP, founded an intentional eucharistic community, Sophia Inclusive Catholic Community, about 25 miles from her home, Claire began attending Sunday Mass there. Sophia quickly became Claire’s faith community. After the sudden and unexpected death of its founder in 2014, the members of Sophia asked Claire to consider pursuing ordination through Roman Catholic Women Priests. Claire answered the call of the community. On April 23, 2016, Claire was ordained by Bishop Andrea Johnson, bishop for the Eastern Region of RCWP – USA, at the Church of the Redeemer in Morristown, NJ. 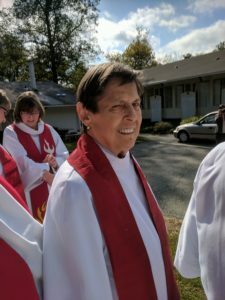 Claire served as co-pastor of the Sophia Inclusive Catholic Community, along with Michael Corso, until her death. In addition to serving Sophia, Claire, a member of AA for 25 years, found creative ways to minister to those in 12 Step Programs and to those marginalized by the institutional church.